I get this question a lot. Actually two questions: Why are you buying an electric car? And why the Leaf among all electric cars? For the answer, I have to take you back about a year and half ago. In the spring 2010, our oldest car turned 10 years old and we started looking around to trade it for a new one. We have two cars in the house, built about five years apart from each other. We found that getting a new car and keeping it for 10 years work the best for us in terms of cost/benefit. We keep them long enough to get a good return compared to leasing, and we still get the pleasure of driving a new car every five years or so. The car we were trading that time was our good old Sienna minivan. Gas prices were a big concern so we decided to go for something smaller. A new Prius model was just being launched, loaded with a huge technology package that makes any geek like me drool, so it felt like a perfect match… until the Deepwater Horizon oil spill happened. I’m no environmentalist but after watching that out-of-control oil spill for three long months, something hit me. 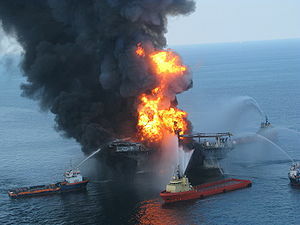 The people that died in the explosion, the extensive damage to marine and wildlife, the communities affected by the impact on fishing and tourism, the pictures from space showing the monster spill moving each day, and the unbelievable cynicism of people in the oil industry, particularly the CEO of BP and his infamous “I want my life back” comment. I just didn’t want to be any part of that. We go to war because of oil. Lobbies inject millions of dollars into the political system in exchange for easy regulations and high subsidies. Per day, tar sands operations in Alberta release as much CO2 as all the cars in Canada combined. Oil companies are the most profitable companies in the planet, and gas prices always go up inexplicably every Friday before a long weekend. Want it or not, we support this industry. We are a society addicted to oil. After the Deepwater Horizon accident, I decided I should try to break my own addiction. In early 2010, electric cars were starting to shift from a model of limited-production and very expensive cars, to a system of mass-production affordable cars. The Mitsubishi iMiev announced a cross-Canada tour, and both GM and Nissan started to take orders for the Volt and the Leaf in the United States. I knew it would be just a matter of time before these cars were available in Canada, so I decided to keep my old car a bit longer and registered as a hand-raiser for all three of them. Both Volt and Leaf were delivered to their first US customers in December 2010. 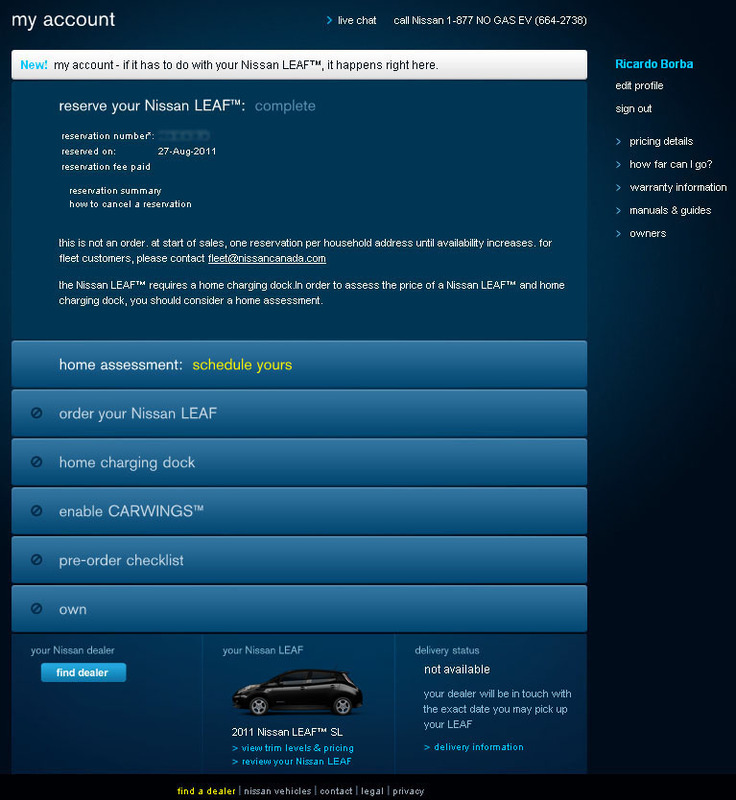 Prices in Canada were announced in the spring 2011 and I was able to test drive a Leaf in May. It’s the car that best fits our needs. It’s 100% electric and it looks and drives just like a regular car. In terms of size, it’s the only electric car available with five seats and considerable cargo space. It is loaded with high-tech features including 3G access for telemetry and an iPhone app. Its 160 Km range is more than we can ever drive in one day in Ottawa so it will be our primary car (with our second car used for backups and longer road trips). The Leaf is extremely silent and has no vibration. It is very smooth to drive and also incredibly fast to accelerate. It has a very low center of gravity allowing for very sharp turns. Overall it’s a lot of fun to drive. I look forward to own a car that needs no visits to the gas station and requires no oil change. A car that is clean and doesn’t contribute to air pollution. A car that doesn’t idle in traffic wasting fuel, uses energy efficiently, and charges at night when electricity demand is low and no coal-fired power plants are running. I also look forward to drive the Leaf in the winter. As one of the first Leaf delivered in cold climates, I plan to monitor the car performance and share the data with other Leaf owners. Finally, the amount of savings we’ll be making in terms of fuel will easily pay back the extra costs during the lifetime of the vehicle. Compared to our other car, it will be like buying gas at 25 cents a liter, saving us at least $1,500 in fuel and oil changes every year. All in all, not a very difficult choice to make. On the home assessment front, the quote from Aerovironment came a bit higher than expected. The reason has to do with the fact that I decided to place the charging station at the far end of the garage, which added to the cost of materials and labor. I asked them to move the station to the near end, right where the wires are coming through the wall, and I’m now waiting for the new quote. I’m also waiting for a second quote from a local electrician who’s installing the charging station of a nearby friend who’s also purchasing an electric car. Let’s see how that goes. It was nail-biting. 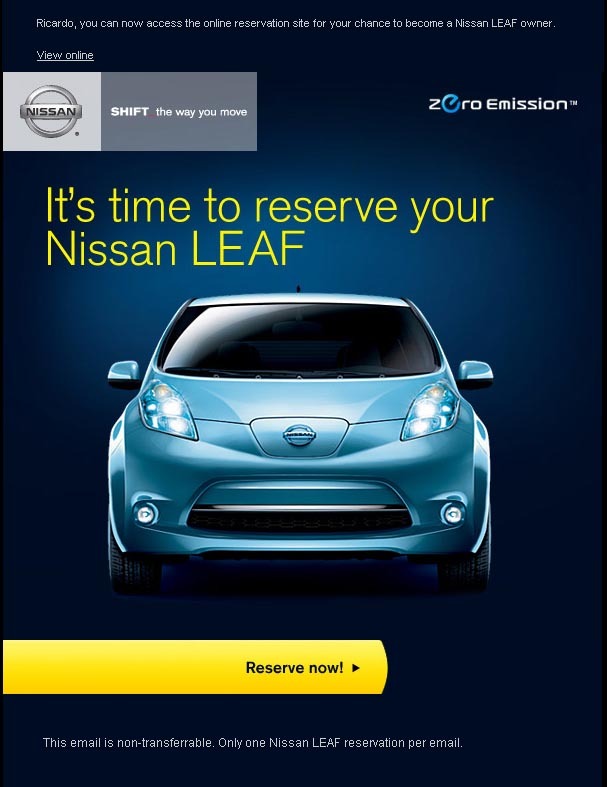 The email from Nissan Canada was expected to arrive at noon, containing the much expected “Reserve now” button. The link would send me to a personal URL, unique to my registration email address. I knew there would be hundreds of people expecting the same invitation and ready to compete for the (only) 40 cars available for consumers in Canada in 2011. The process is on a first-come first-served basis, so the race was on! I didn’t want to run any risks of power outages, computer crashes or network failure so I had a backup laptop fully charged, tethered to my 3G phone and ready to go if something went wrong with my desktop. I also had three different browsers installed in case I ran into incompatibilities from the reservation system. I use Chrome as my default browser but decided to switch to Internet Explorer just in case the reservation system was browser-picky. So punctually at 12:00PM the email came. And with it, the first surprise: Internet Explorer security settings wouldn’t allow me to see any images on the email, much less the Reserve Now button. No time to fiddle with settings, so I quickly switched back to Chrome which worked just fine. The reservation site opened, asked me to create a username, password and to enter my address. Done, submit. Error! No space allowed in the postal code. Duh! Go back, removed space, another error. Postal code doesn’t match province. I’m pretty sure I had entered ON but after the postal code error, the form apparently reset the province field back to AB… No problem, changed it back to ON, double checked everything, submit, another error! This time, no email address. How can that be? The form came with the registration email address already filled and read-only! Nevertheless the email field had just disappeared… OK, time to start over. Closed that session, clicked on the Reserve Now button again, entered all the data one more time, everything went through this time. I then answered all the questions, chose the trim level, color, QC port, and finally got to the $99 deposit page. Entered my credit card number, waited… Bingo! Time was 12:05 and I had just received my reservation number! Despite all the errors and delays, it looks like I was reservation #10. How do I know? It’s very unofficial. Nissan went through all the trouble of making the reservation number an apparently random 32-bit hexadecimal number, but a friend at the Nissan Leaf Canada Facebook page cleverly noticed that the Transaction ID of the payment confirmation appears to be a sequential number. Mine ended with a 10. His was a bit higher and so was his friend’s. And we all registered about the same time (at the very beginning). Then came the second part of the reservation: Scheduling the home assessment. Piece of cake, I thought. Just select the first available date, right? Not really. At the reservation calendar page, I got an error message saying “there are no available dates found in your postal code. please contact Nissan Canada call center at 1-877 NO GAS EV”. Great… I called the number, explain the issue to technical support, he kindly asked me to stay on the line while he called Aerovironment, Nissan’s EVSE partner. He then put me on a 3-way call with the Aerovironment support, who took my info and promised to call me on Monday with a resolution. At this point, I tried to login at my account page and noticed that the system was really overloaded. 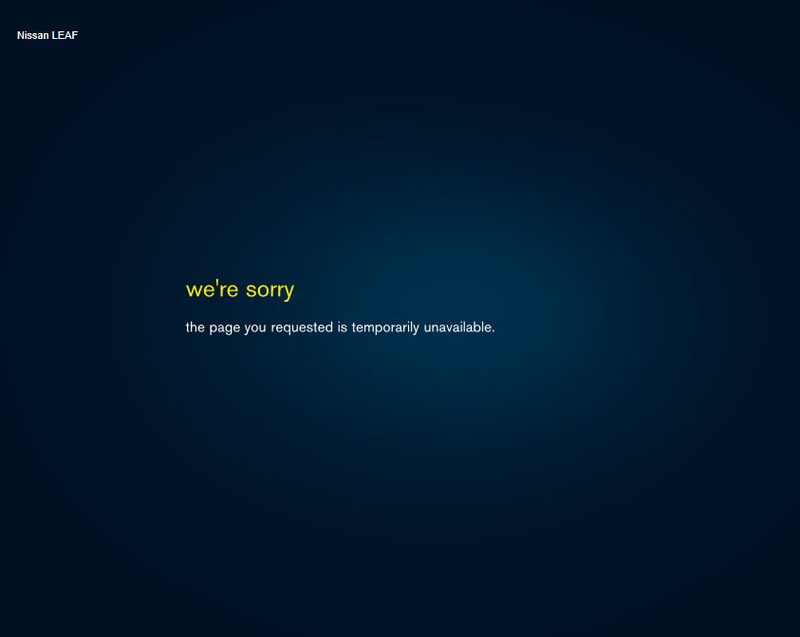 Anyone trying to access the reservation page would either time out or get a “temporarily unavailable” page. Not nice. I came back about an hour later and the home assessment issue had been fixed. I was finally able to set up an appointment, but only to September 13th! That was the earliest date available but Nissan told me they’re trying to get earlier dates and that I should get a call if they are able to. So here’s how my account page looks like once the reservation process is completed. The home assessment line changed to “scheduled for <date>” once the appointment was booked. Overall, it was a fairly stressful but still fun experience. Nissan was definitely caught a bit off guard in terms of server performance but it served to show that the amount of interest in this car is just fabulous. I hope Nissan will upgrade their server capacity before the next wave of reservations, because I’m sure the interest will quadruple when people start seeing this car on the road! Just got an email from Nissan Canada telling me to watch my inbox this weekend for a special email containing a much expected “Reserve Now” button . It looks like everyone who registered as a “hand raiser” and living within 65 Km from a Leaf dealer got the same email and therefore will have a chance to reserve one as well. Given the limited number of cars available for Canada this year, it will be a race! 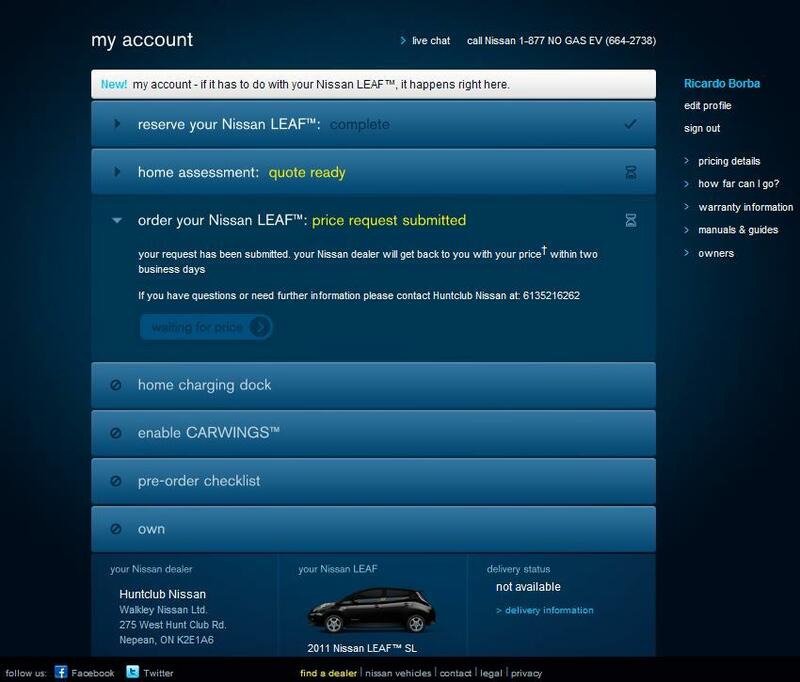 Nissan has finally announced the network of dealers that will be trained to sell and service the Nissan Leaf in Canada. Ottawa is getting Hunt Club Nissan, which is about 15 Km from my house and within walking distance from where I work. That basically means I qualify to get in line and purchase the car, since you have to live within 65 Km of a certified dealer to be able to do so. But between you and me: Ottawa is not that big so basically anyone living in Ottawa will qualify.